Meet the Vibrant Girl team. What a girl takes to heart today will impact the woman she is tomorrow. Provide her with a fun resource that is wholesome, pure, and beautiful. Engaging content created especially for girls ages 12-15. 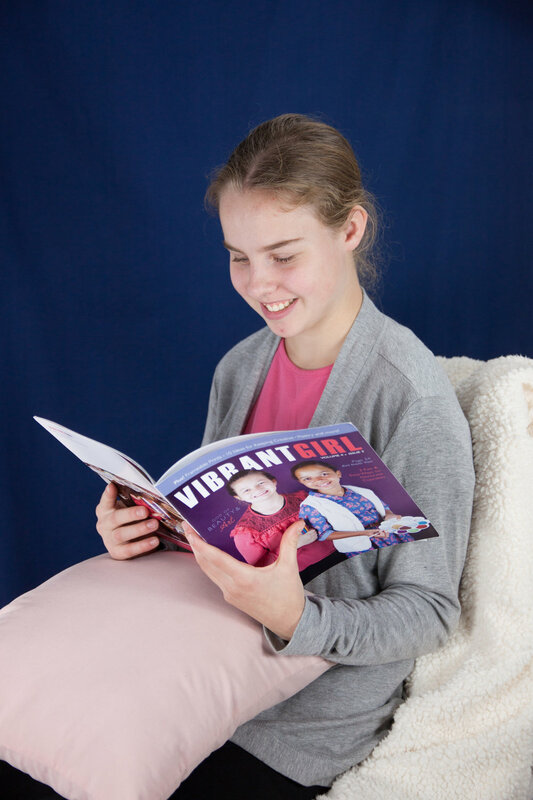 ...or gift a copy of Vibrant Girl to a daughter, sister, or friend! Note: Limited supplies available, buy them while they last! You can now choose to have your subscription automatically renewed annually! Each full-color issue arrives in her mailbox, ready to be held in her hands or set on her nightstand. Printable gift-certificates available after check-out. What does it mean to live a wholehearted faith? Watch the promo video to learn about the heartbeat of Vibrant Girl's ministry. "Vibrant Girl is a breath of fresh air, inviting young women to lives of authenticity, integrity, and passionate relationship with Jesus." Offering guidance to the women of tomorrow. We believe what a girl takes to heart today will greatly impact the woman she is tomorrow. With so many lies bombarding womanhood today, we can either spend all our energy steering girls away from evil or drawing them to Jesus. By providing them with a colorful resource centered on God's Word, we hope to do the latter... and have some fun along the way! Subscribe for one year, or choose to have your subscription automatically renewed annually! Send us your questions, thoughts, and submissions! Follow Us On Facebook for Exclusive Sneak Peeks and More!